AAPL 06/01 $167.50 & $170 Calls, and as it turned out, we got a fairly decent performance out of those over the course of the day. Those contracts are going to be pushed deep into the money with the gap up occurring on the heels of yesterday’s post-market earnings beat. We’ll be looking to lock in profits at the open in expectation of a dip-and-rip pattern, and if we get what we’re looking for, we will also test the waters with some other calls, the AAPL Weekly $172.50 & $175 Calls. We were just commenting yesterday morning on how we tagged SGSI on April 25th, only to see it run from .0055 that morning, and go on to rise over 100% as it ran to a high of .012. Options Recap – We cast a pretty wide net with respect to options ideas in the retail sector in our premarket report yesterday morning, and our efforts didn’t go unrewarded. Both EXPR and AEO provided us with some nice chances. Express, Inc. EXPR – We were tracking the EXPR 09/15 $6 & $7 Calls. The $6′s traded in a range from .45 -.92 for a gain of 104%, while the $7′s logged an even 100% double-bag run from .15-.30. American Eagle Outfitters, Inc. AEO – For American Eagle, we were looking at the AEO Weekly $12 & 12.50 Calls. The $12′s recorded our biggest options gainer of the day with a 212% move from .08-.25, and the $12.50′s were another even 100% push , trading from .05-.10 on the day. More Ideas - We’ll keep the post-earnings retail options train rolling today with two fresh sets of ideas using the Abercrombie & Fitch Co. ANF and Dollar Tree, Inc. DLTR chains. We’ll have the ANF Weekly $10 & $11 Calls, and the DLTR Weekly $78-82 Calls on watch as we head into week’s end. We included RMRK in yesterday morning’s premarket report, after noticing some abnormal activity building up in the previous session. The move occurred on volume of more than 1.8 billion shares traded; an all-time high for RMRK. Although the dog days of summer made July a fairly subdued month, August has started off pretty well so far, with our first multi-bag gainer showing up in the form of SRMX. We included it in our premarket report yesterday morning after catching the PR the company released on a routine news scan, and were happy that we did. The options idea we submitted on LL earlier this week has made some decent progress that we wanted to report back to our readers this morning. The stock has strung together two bullish sessions since then which has facilitated the following moves in our highlighted target contracts, the LL Weekly $27.50-29.50 Calls. The listed lows were logged on Tuesday, and highs recorded yesterday. We also put STBV on our radar yesterday morning and it too produced a positive move on the day. From its low of .0731 the stock ran as high as .145, an intraday rip of 98% which came on more than nine times the monthly average volume. We’ll continue to keep an eye on STBV which is at multi-year highs and firmly in blue sky breakout territory. We also want to circle back to MTBC, which we’ve been tracking since the morning of July 17th. Shortly thereafter the stock saw a low of 1.08 and it hasn’t looked back.Yesterday it reached a new high of 2.39, which marks a 121% run through a period of just over two weeks. We’ll continue to stay on its track, as the company just posted a solid quarterly report which included a 55% boost in revenue. Having written our daily newsletters for such a long time, occasionally we run back across a stock that we haven’t seen in quite some time, and that was the case with BMXI. Before yesterday’s signal on it, we hadn’t mentioned it since May of 2012 back when it was regularly trading in the subpenny range. It found its way to our radar screens and into our premarket report yesterday morning on word of a promotion (Disclosure: We were not involved in the deal), and what followed was one of the biggest breakouts the stock has ever had. From a low of .0831 it soared to a new all-time high of .1279 . That’s an intraday gain of 54% which came on enormous volume. Our regular followers know that we’re always on the lookout to take advantage of the hype-fueled moves that stocks tend to make following an earnings report, using their options chains. Delta whiffed on profits this quarter, falling well short of expectations on the Street, and despite issuing solid guidance for Q3, we want to signal a range of short-term puts to watch into the end of the week. DAL stock was already at a top, and in a price range where profit-takers could be a factor as well. For that reason, we are going to radar the DAL Weekly $55.50-53.50 Puts. OBMP had an update that it issued this morning on its mid-stage cancer treatment (>>View PR), but our interest is really being drawn to this play for technical reasons. As you can see below, the stock recently established a new annual low, followed by a rebound off of that low, and now it is making its way back down to find support. We will be interested in this as a potential rebound play in the event that the stock maintains support at or above a nickel. 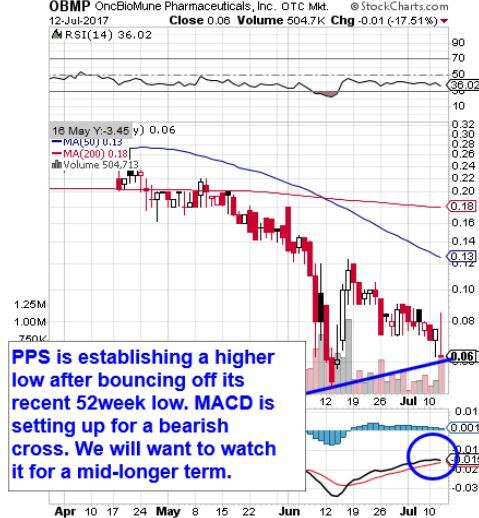 We’re presently looking at an impending bearish cross on the MACD so we’ll see if the stock can hang in there without losing more than a penny off of its current PPS. We tagged BRAV in Friday morning’s premarket report after noticing increased volume and price action in the stock on our routine morning scan. It responded with one heck of a strong intraday performance, allowing traders a shot at a double bagger on the day. BRAV traded up from its early morning low of .00128 to hit a high of .0028 shortly after 12:40pm, which was good for a 118% rip, and it came on 20X the 30-day average volume. We wanted to briefly mention our DE options idea for Friday’s session, the DE Weekly $118-121 Call. We normally include the exact gains made by our options calls, but are unable to on this play due to a technical difficulty, so we apologize for that. That being said, DE ran from 119.00 to 122.24 on the day, and the potential for multi-bag gains in every single one of our highlighted contracts certainly were there for the taking. 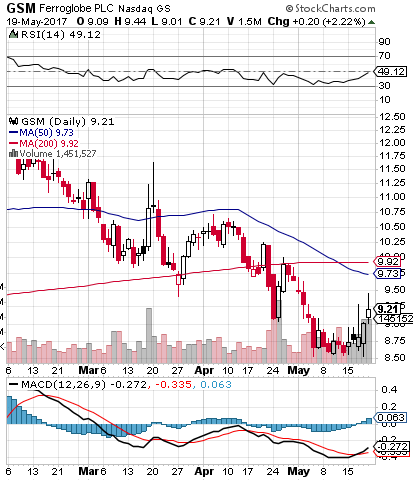 A stock that’s hitting our scanner today is GSM, which recently came down to touch the lowest prices it had seen in eight months, and has been rebounding in anticipation of Q1 Earnings, which were released yesterday and are untraded-upon. Additionally, the RSI on the GSM chart is about to break the 50-line, while the MACD has just undergone a bullish cross. A return to PPS levels of just three months ago would produce gains of 30% or more from current pricing. We’ll place GSM on watch over the next few sessions and will be interested to see how the activity plays out. We were tracking GLYC late last week, and it turned out to be a rousing success. The stock saw a low of 7.21 on Thursday following our premarket alert, and on Friday it hit 14.64, for a two-session swing of 103% which is fantastic for a stock in this price range.